You can research your family history in any NPT Library using Ancestry Library Edition. 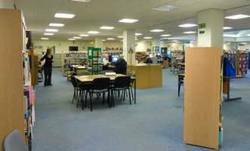 Neath and Port Talbot library both have comprehensive reference collections that provide access to a vast assortment of books, newspapers and magazines. In our local studies sections we have a large collection of local history books covering both towns and the surrounding districts and Wales in general. We also have current and historic ordnance survey maps, local newspapers, over 2000 photographs, census records, electoral registers and council minutes. There is also access to FREE online reference resources via our e-resources page. If you are just starting to research your family history or you have found out as much as you can by yourself- why not call into Neath or Port Talbot library to see if you can discover more. At Neath Reference Library you can book one-to-one introductory family history sessions with staff. This includes an introduction to all resources available at the library and an online tutorial for Ancestry (library edition). Don’t know where to begin? Then help is at hand using a library computer! Informal drop-in sessions help you use the Ancestry Libraries website free of charge through your local library with Heritage Education Officer, Harriet Eaton. For more information please ask at your library or contact Harriet Eaton, Heritage Education Officer at Neath Library (01639) 644604. If you are interested in local history, why not also visit our Museums pages? If you are interested in getting involved, Neath Port Talbot has a number of voluntary History and Heritage groups which work enthusiastically to preserve, research and make available the rich heritage of the area.